Our Montana Fly Fishing Guides’ staff has been hand picked over the last decade to bring you one of the finest groups of guides you’ll ever run across. These are professional Montana fly fishing guides who have years of experience on every piece of water we fish, no college kids with a summer job. Our core Montana guide staff have a passion for fly fishing that has taken them across the country and around the world to pursue fish on the fly. Eric Adams grew up in the Mid-West chasing trout throughout Michigan and Wisconsin. His obsession for all things fishing began a journey that has led him to numerous states and countries pursuing dozens of species of fish on the fly. This passion led him to an undergraduate degree in Environmental Biology and a Master’s degree in Ecology. This background allows him to convey a unique perspective while guiding ensuring a day on the water is an educational experience. He can use this education to translate the fishing, the surrounding ecological landscape, and most important techniques that put a bend in your rod. This lifelong journey eventually led Eric to the of trout capital of fly fishing in Livingston, Montana. Eric Adams currently operates Montana Fly Fishing Guides – one of the area's most successful outfitting operations where he is the head guide and cat herder. In his not-so-spare time he is the Director of Fishing Operations at Yellowstone Valley Lodge, a former director of the Fishing Outfitter Association of Montana (FOAM), a business supporter of Montanan’s for Healthy Rivers, an ambassador for Adipose Boatworks, a business member of Upper Missouri Watershed Alliance (UMOWA), and a business supporter of Yellowstone Gateway Business Coalition. He is also affiliated and endorses the following fly fishing products - Hodgman, Echo Fly Rods, Costa Sunglasses, and DECKED truck storage systems. Born and raised in NW Wyoming, Nicolette always had an affinity to being outdoors. Her passion for fly fishing has further developed since moving to Montana over 15 years ago. Her personal fly angling accomplishments include everything from trophy New Zealand Brown Trout, Belize Bonefish to Florida Keys Tarpon. With regard to MFG, Nicolette is in charge of client and guide services. So if you're looking for other activities, lodging reservations, or concierge work while you're in town Nicolette is your contact person. When she's not busy with those duties you can find her writing guide checks, bookkeeping, returning phone calls, guide bookings and general gettin-stuff-done happens with her in charge. She is also Eric's best fishing, travel and wife. When she's not in the office you can find her fishing, paddle boarding, practicing yoga or hiking. Zach Pleshar was raised right here in Livingston, Montana. He spent his childhood running around the mountains and rivers of Paradise Valley. He’s got a play hard / work hard ethic, which is obvious to all the anglers who request him. Zach Pleshar thrives in all aspects of guiding from teaching the finer points of fishing techniques to the simplicity of just enjoying a great day on the water. He’s been guiding for over a decade on his home waters as well as spending four seasons in Western Alaska. It’s no wonder he’s one of our most requested guides. Tony "V" Valeriano has been fishing since he was a small boy and has enjoyed putting’ the hurt on trout in Montana since the mid-80’s. He has been guiding anglers since 1990 and is certainly one of the most knowledgeable guides in the area. Tony Valeriano has an easy going, but knowledgeable style of guiding which is complimented by his infectious humor. Anglers in his boat will always come away from a day of fishing with better skills and great memories. When he’s not spending time with his wonderful family he can be found fishing, bow hunting, chasing upland birds, or skiing the fabulous powder of the Rocky Mountains. Originally from northern Michigan, Jeff Welke started fly-fishing at ten, tying flies at twelve, then guiding and teaching fly-casting instruction at 17. He managed a fly shop and guided in the summers while pursuing his college degree. After discovering the local area during a trip to Yellowstone, he made the move out west to pursue the sporting life he dreamed of since childhood. After moving to Livingston, he spent several years as the former general manager of Dan Bailey’s Fly Shop. Jeff is one of our full time guides as well as an excellent real estate agent (if you’re looking for some river side property). He spends the summer months guiding fishermen on his favorite streams in the area while sharing his passion for angling and instruction. Jeff resides on a ranch south of Livingston with his three bird dogs and enjoys spending the off season gardening, foraging for wild mushrooms, wandering around in the mountains or hunting for big game animals and birds all across the state. Jesse Dancer's life long passion for fly fishing started on the banks of the McKenzie river in Oregon where he spent many hours chasing trout and steelhead. While born and raised in Oregon, this passion led him to start guiding anglers in Alaska. Jesse dedicated 6 years to developing his guide skills in Alaska where his hard work and leadership didn't go unnoticed as he left the lodge as head guide. Alaska was just a stepping stone for Jesse as Montana had always been on his personal and professional radar. After spending several partial years in Montana Jesse made his full time move to Livingston. The past several years have proven Jesse to be an exceptional guide and we are proud to welcome him as our newest core guide. When Jesse isn't guiding or fishing the many great rivers in Montana you (can try to) find him on a horse looking for elk, or on the coastal waters of Oregon swinging flies in search of steelhead. Josh Mills youth was spent on small creeks and lakes in California perfecting his cast and learning as much as he could about trout and their habitat. Like so many before him this obsession led him to follow his dreams and pursue a career in fly fishing. Several years ago, he moved to Livingston, Montana and spent most of his free time studying the local rivers and fishing every free moment. In 2014, he spent a season guiding in Alaska’s Bristol Bay area to further his guiding skills. Alaska matures guides and teaches them different fishing techniques. This could certainly be said for Josh, but it only strengthened his draw back to the waters of Montana. Josh Mills commitment to understand the local fisheries was underscored during his work with a local fly shop, where he quickly learned the area including Yellowstone Park, the famed Yellowstone River and many lesser known streams. His guiding skills now extend to many rivers throughout Southwestern Montana. He is a hard working, enjoyable guide who provides memorable experiences for all his anglers. There’s little more complimentary to a guide than hearing his anglers praise his patience, instructional ability, and pure enjoyment of the day. We hear this from Josh’s clients – A LOT. Today, you can find him fishing even in the coldest days of the winter or tying flies. But if you miss him there maybe look to a chairlift at the local ski hill or cross-country skiing in the surrounding areas of SW Montana. Will Lassiter was born and raised in North Carolina, but now resides in Livingston as one of our Montana Fly Fishing Guides staff members. He caught the fly fishing bug at an early age, chasing bass and panfish everywhere he could wet a line. After completing his degree from the University of North Carolina, he followed his passion for fly fishing west landing in Livingston for a summer position at Dan Bailey’s. The “summer job” started in 1995 and while he no longer manages the fly shop he continues his work on the river. Will is equally at home on the large rivers of the Yellowstone, Madison and Missouri, and the more intimate creeks in the area. He enjoys going the extra mile to find that less fished stretch of water to provide you with a great angling experience. During the off season you can find Will out on the prairies of Montana dutifully in pursuit of his dogs, and hopefully a covey of upland birds. Originally from Colorado, Matt Nispel was introduced to fly fishing when a friend pressed him to tag along on a late October trek to a high mountain lake impersonating a hockey rink. Undeterred by that failed first outing, Matt began teaching himself to fly fish and was soon spending every spare minute away from work in the insurance industry tussling with the savvy trout of Colorado’s South Platte, Arkansas, Frying Pan and Blue rivers. After a decade of honing his skills and having had his fill of life in a cubical, the allure of working outdoors as a guide couldn’t be ignored any longer and he moved to Livingston in 2011. Like a many of the Montana Fly Fishing Guides before him, he guided and worked as general manager for Dan Bailey’s Fly Shop. This allowed him to gain extensive knowledge of the best fishing throughout Montana. Fly fishing crossed over from sport to lifestyle a long time ago for Matt, and he’s eager to share it with those who he fishes. Known for his persistent smile, work ethic and easy going approach “Matty” is a guide who can add insight to any seasoned anglers day, get beginners up to speed quickly, and show either a fun time on the water sharing laughs along the way. Lance Gray was raised in the Paradise Valley just South of Livingston having grown up in an outdoor family. Lance cut his teeth on the Yellowstone River and surrounding streams at an early age. 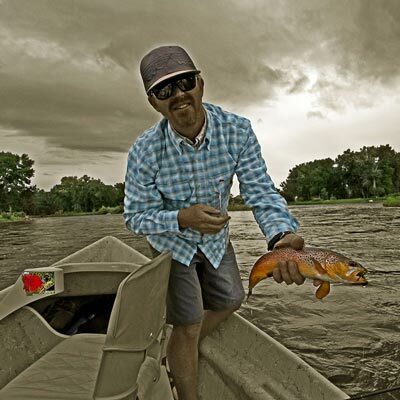 While in high school and through college Lance guided raft trips on the Yellowstone, Gallatin, and Madison whitewater sections, always taking time to fish. Holding a degree in Communications Lance concentrates his focus on casting technique, fishing skills, and local area history. Lance holds a tremendous amount of knowledge and patience so whether you're a beginner or expert, you can be rest assured after a day on the water you will walk away a better angler. When not on the water, Lance spends his time teaching his kids how to fish, come fall he’s busy chasing Elk and Upland birds. Russell has spent his life pursuing outdoor experiences ranging from fishing and floating around the world to horse packing and hunting through the mountains of Montana and Wyoming. Russell Elwell was chosen as the 2009 Wyoming Guide of the year. He has been guiding folks in the wilderness of Montana, Wyoming, and Alaska for 13 years and has numerous stories and experiences to share with his guests. He is dedicated to providing memorable experiences in an easy going fun atmosphere and concentrates on teaching fishing techniques, casting skills, knowledge of the river and local history. His goal is for every angler to come away with greater fishing skills, appreciation of the rivers and new memories. Russell spends his winters sliding the slopes and seeking out comfortable climates to relax. He lives in Livingston, Montana with his wife, two young boys and his dog. Carlisle was born and raised in Alabama but made the move out to Montana several years ago to pursue a life filled with trout fishing and managed to get a degree from MSU along the way. He was first introduced to trout fishing at the age of nine, and grew up fishing for a variety of species throughout the South. However, upon visiting Montana with his father as a teenager he fell in love with the rivers and mountains of southwestern Montana. It just proves you never know what will come from the family vacation. No matter what your skill level, a day on the water with Carlisle is sure to be fishy, fun and educational. When he isn't chasing fish on the fly you'll likely find Carlisle hunting, playing music with his friends, or cheering on the Crimson Tide. Todd grew up fishing the lakes and rivers of West Virginia, Pennsylvania and Michigan – catching whatever he could find in the water. He has lived and guided here in Montana for 22 years now – along with guiding four seasons in the Bristol Bay region of Alaska. His longtime passion for guiding fly fishing trips has made him one of the premiere guides in the area. Todd likes to spend as much time as he can fishing, hunting, or skiing. He is known for his patience, knowledge, and enthusiasm. If you spend a day on the river with Todd, you can be rest assured that he will do everything in his power to make sure that you have a fun, memorable and successful experience. Started fly fishing the numerous trout streams of Colorado, since then he’s spent the majority of his life guiding fly fishermen in locations from Argentina to the Florida Keys and here in Montana. His good humor, patience and unsurpassed fishing knowledge make him a great instructor for experts or beginners. Perry has been with us for nearly 2 decades. His knowledge of the local waters is extensive – everything from entomology to spey casting. We guarantee you won’t find a more well rounded Montana fly fishing guide. Captain Perry Coleman winters at Islamorada in the Florida Keys where he guides saltwater flats fishing. If you’re looking for a great Tarpon, Bonefish, Redfish or Snook fishing experience he’s definitely the one to call. Contact us and we’ll be happy to arrange something for you. 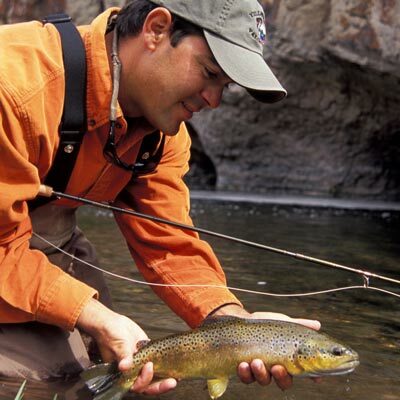 Jeremy Brown Staff Guide started fly fishing as a youngster on the tributaries of the Finger Lakes in Western New York. After graduating from the University of Montana with a BS in Wildlife Biology, he has been working and fishing in far off places. He has wet a line from Alaska to New Zealand. Since landing in Livingston in 2012, he has grown close to the many different trout streams in the area. From the dry fly flats of the Missouri to the big freestone runs on the Yellowstone, Jeremy enjoys sharing his passion for fooling big sky trout with clients from all corners of the globe. A day on the water with Jeremy is always an enjoyable experience. His clients praise his patience and persistence. He is an extremely hard working guide who is equally at home dropping anchor and chatting about the mink or the osprey on the side of the river. He spends the fall months guiding archery and rifle hunters. In the winter you’ll find him keeping tabs on wintering elk and tying flies. Nolan Majcher lives to fish. His fly fishing career started on the difficult trout streams of Pennsylvania. The wary trout of his old stomping grounds forced him to perfect his craft. To fund his fishing habit, Nolan worked for Orvis as head casting and fly tying instructor. As an instructor he taught hundreds of anglers, both novice and veteran, proper technique. 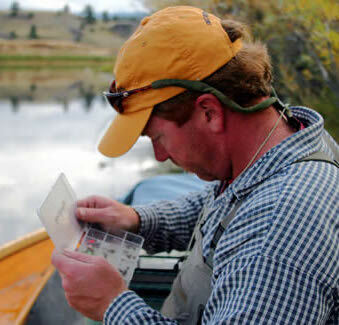 Equipped with the knowledge to be an excellent guide, Nolan migrated to the fishing paradise of the Yellowstone Valley. His passion for fishing is contagious when spending a day on the water together. Clients love Nolan's laid back nature and no nonsense approach to getting fish in the net. 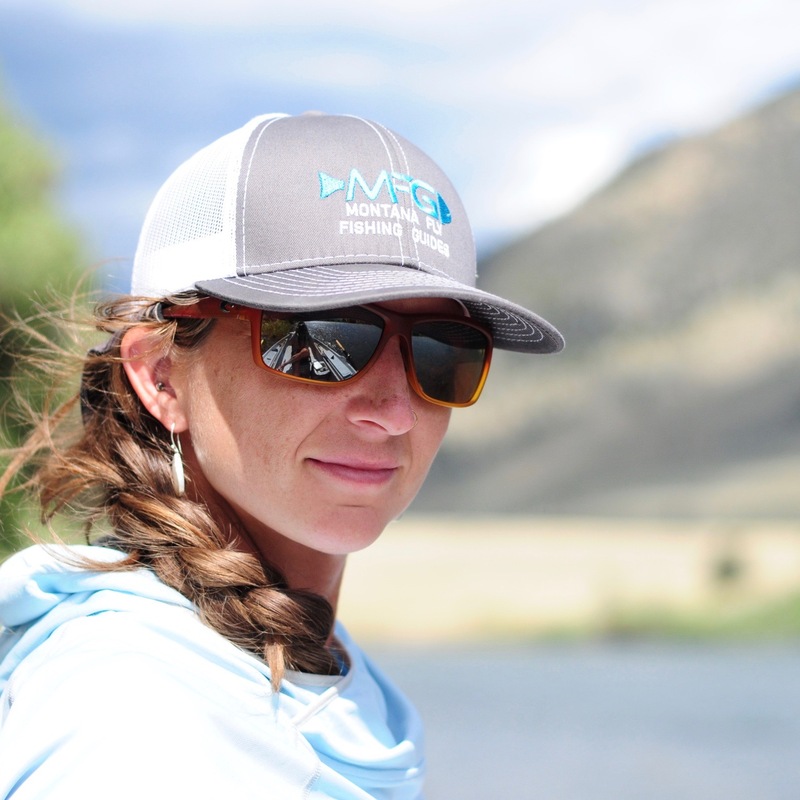 Montana Fly Fishing Guides Marya Spoja is a native Montanan who grew up on her family’s ranch in Lewistown, Montana, just a short two hour drive from Livingston, Montana. Marya grew up trying to catch minnows with her hands and in general running around causing trouble on and around the family property. It wasn’t until graduating from Montana State University and moving to Livingston that she discovered the joys and frustrations of fly-fishing. A passion, to which many can attest, has now fully taken over her life. Marya worked and managed a local Fly Shop for 8 years helping anglers explore the vast regions of Paradise Valley, Yellowstone National Park and the surrounding rivers we at Montana Fly Fishing Guides call home. As an MFG guide Marya Spoja is a great fit. She is an exceptionally personable guide, and has great insights and instructional skills - from a woman’s perspective, and can develop the skills of all anglers & abilities. You’ll find her affable demeanor, off beat humor and love of fly fishing evident on ever guided trip with her. While the guide season is exceptionally busy, on her days off you’ll find Marya out there finding new places to fish with her best companion Pearl (an adorably friendly Malamute). Good luck trying to find her in the winter time as she’ll be out somewhere working with Yellowstone Dog Sled Adventures or taking some personal time to ski. Originally from northern California, Eric Paramore honed his fishing skills on the many great west coast trout and steelhead fisheries. Paramore moved to Montana in the late 1990’sand started working for Dan Bailey’s Fly Shop. After several years in the shop we were excited when he joined our guide staff full time. 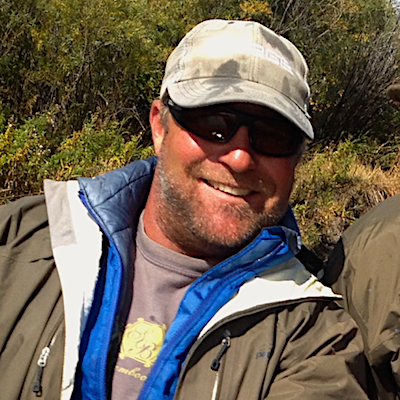 You’d be hard pressed to find a guide with a better disposition, infectious humor and fishing knowledge. Whether you’re fishing the technical waters of the spring creeks, the Yellowstone River, or rowing the rapids of the Boulder River you’ll find his guidance insightful. Eric is a signature fly tyer for Umpqua and specializes in grasshopper imitation. He spends his winters fishing and tying up the next best hopper pattern for the Yellowstone River. Living and working in Paradise Valley is truly a dream come true and makes every day an adventure! When you visit here, you will understand what we mean. Every summer, our entire Paradise Adventures staff works and trains hard so we may show you what Montana and Yellowstone have to offer. Click to learn more about a Yellowstone River Rafting Trip with Paradise Adventure Company. Chris Hondorf is the owner of Yellowstone Guidelines. Yellowstone Guidelines specializes in guided tours and adventures in Yellowstone National Park. If you're looking for a private wildlife and scenic tours, backpacking, day hiking, Yellowstone wolf tours, or a multi-day adventure the we highly recommend Chris and his staff. Originally from New York, Chris migrated to Bozeman, MT shortly after graduating college. Playing and living in southwest Montana for the past 13 years, Chris loves showing visitors the wonders of Yellowstone. He now lives in Livingston, MT with his wife Annie and daughter Nola. To book a Yellowstone Tour with Chris, contact Eric Adams or visit www.yellowstoneguidelines.com.